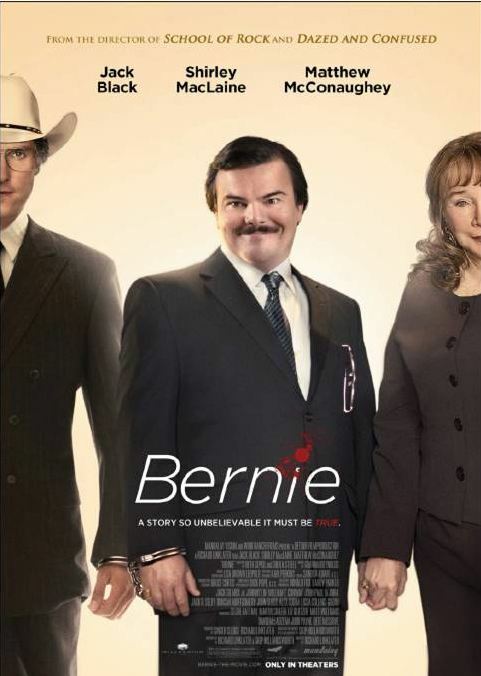 Bryan’s Review of Linklater’s ‘Bernie’!!! Richard Linklater’s film, Bernie, was inspired by an article in Texas Monthly Magazine by Skip Hollandsworth titled ‘Midnight in the Garden of East Texas’. The article was an editorial about a murder committed in the small East Texas town of Carthage, Texas. Hollandsworth’s editorial argued that the entire town supported the killer, rather than the victim. Regardless of the fact that the killer confessed, the evidence proved his guilt, and a court sentenced him to life in prison, the entire town still believes he is innocent. This real-life story translated into a hilarious dark comedy. This is the true story of 39-year old Bernard Tiede (Jack Black), an assistant funeral director in Carthage, Texas, who murdered Marjorie Nugent (Shirley McLaine), his 81-year old millionaire female companion. Bernard first became friends with Marjorie when her husband died. Because Marjorie is hated by everyone in the community, no one attempts to console her after her loss. Bernard, being the good man that he is, attempts to be Marjorie’s friend and overlooks the fact that Marjorie was abusive and cruel to everyone around her. After some effort, Marjorie softens and takes a liking to Bernard. Over the next couple years, he accompanies her on vacations, she allows him to spend her money, and she names him as her sole heir. Bernard altruistically spends all of her money on the community rather than himself. He is easily the most popular guy in town and loved by all. Although he gains respect from the community, Marjorie constantly abuses Bernard verbally. The abuse escalates until he snaps, shoots her, and hides her body in a freezer for nine months. The scenes between Bernie and Marjorie leading up to the murder are amazing. You empathize so much with Bernie because he spends so much of his time as Marjorie’s victim. You almost want to root for him when he grabs his gun. Linklater (School of Rock, Dazed and Confused) made this film in the vein of a Christopher Guest film. Throughout the film he intersperses footage of head-shot interviews with the actual citizens of Carthage, Texas. Scenes with the actors would be prefaced by the memories and speculations of the citizens of Carthage. This is where the comedy comes in. Their thick Texas accents and love for Bernie goes a long way in the film. You find your self laughing out loud, even though someone was killed in cold blood. This might be Jack Black’s finest performance to date, followed closely by his performance in Linklater’s prior film, School of Rock. The real Bernie Tiede was an effeminate guy, who was rumored to be gay. He was flamboyant, and one of the sweetest southern men you’d ever meet. Jack Black plays Bernie to perfection with his own over-the-top charm. Yet we also get to see glimpses of that famous Jack Black evil grin — you know, the one that makes you think that Bernie could actually be a cold, sadistic killer under that warm, southern exterior. Matthew McConaughey, who played District Attorney Danny Buck Davidson, also did a great job playing the level-headed lawyer that must find a way to get a change of venue because no jury made up of Carthage citizens would ever convict Bernie. If you have not read the Hollandsworth article yet in Texas Monthly, I suggest you wait until after you see this film. Let the movie surprise you with where it will go. You’ll find yourself siding and bonding with a convicted killer. Bernie is a great film, even if you come away feeling like you have gotten too close to a murderer and laughing all the way till the end of the film. This entry was posted on Friday, May 4th, 2012 at 4:11 am	and is filed under Film, News. You can follow any responses to this entry through the RSS 2.0 feed. You can skip to the end and leave a response. Pinging is currently not allowed. « ‘Avengers’ Assemble!!! Bryan’s ‘Avengers’ Review!! !